The Geostationary Operational Environmental Satellite (GOES-R) Satellite Proving Ground project engages the National Weather Service (NWS) forecast and warning community in pre-operational demonstrations of selected capabilities anticipated from the next generation of National Oceanic and Atmospheric Administration (NOAA) geostationary earth observing systems. Infusing GOES-R products and techniques into the NWS operational environment, with emphasis on the Advanced Weather Information Processing System (AWIPS) and transitioning from AWIPS-I ("AWIPS Legacy") to AWIPS-II ("AWIPS Migration"). A key element of this activity is a sustained interaction between the developers and end users for the purposes of training, product evaluation, and solicitation of user feedback. The Proving Ground relies on close coordination with the GOES-R Algorithm Working Group (AWG) and Risk Reduction programs as sources of demonstration products, and will enhance the operational transition pathway for those programs. The intended outcomes of this project are Day-1 readiness and maximum utilization for both developers and users of the GOES-R observing system, and an effective transition of GOES-R research products to the operational weather community. The GOES-R Proving Ground will facilitate the testing and validation of new ideas, technologies and products before they become integrated into operational use. 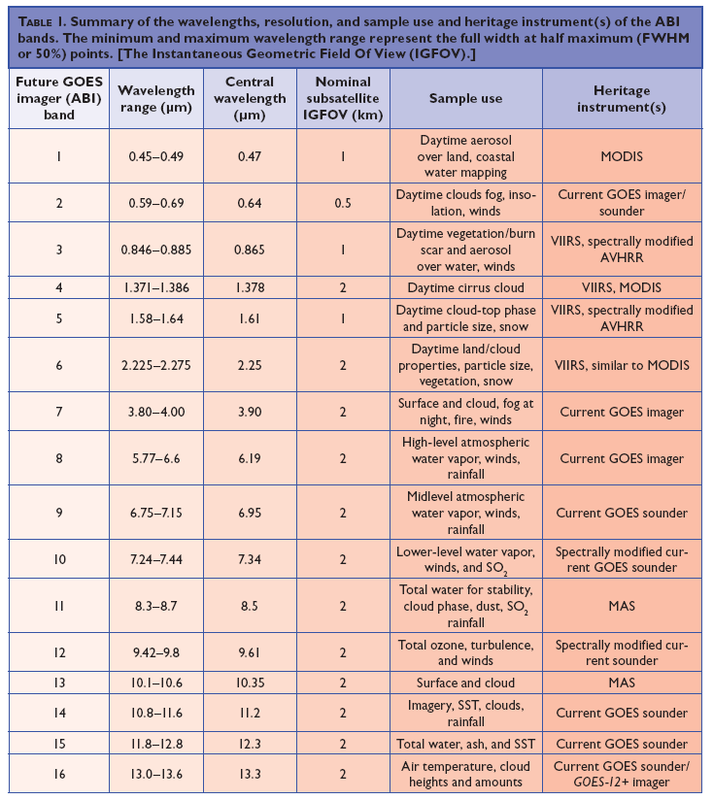 This proving ground is an essential component of GOES-R risk reduction, which will help to ensure that users are ready for the new types of satellite imagery and products that will be available in the upcoming GOES-R era (Table of ABI bands). GOES-R is scheduled to be launched in 2016. The proving ground concept will allow satellite product developers at CIMSS, CIRA, and SPoRT to be involved with National Weather Service (NWS) forecasters at an early stage in product development, providing a unique opportunity for interaction between developers and users; CIMSS, CIRA, and SPoRT will continue to build on the close relationships already established with their local and regional NWS Forecast Offices. Both the satellite product developers and the forecasters will test, apply and evaluate algorithms for new GOES-R satellite data and products using proxy and simulated data sets, including MODIS, AIRS, IASI, SEVIRI, NAST-I, NPP/VIIRS/CrIS, and model-simulated products.